Nayanthara attended day two of SIIMA Awards wearing a simple off-white khadi saree teamed with contrast red sleeveless blouse. Side swept hair and a statement necklace by Amrapali Jewels completed her red carpet look. She looked simple and elegant. We love!! 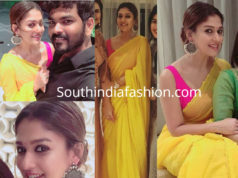 Nayanthara’s Costumes in Viswasam – Fashion Goals!